Have you ever felt overwhelmed trying to decipher a food label or sift your way through the health claims? With seven syllable ingredients and symbols to denote nutrition ratings on the label, it can be difficult to determine what to eat. 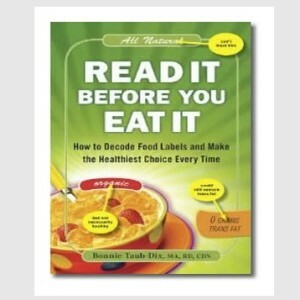 Registered dietitian and national spokesperson for the American Dietetic Association, Bonnie Taub-Dix, helps us become label reading experts in her new book, “Read It Before You Eat It.” With an aisle by aisle shopping guide that can be used by anyone in any store, any city and at any price point, author Bonnie Taub-Dix makes healthy shopping easy. SuperKids Nutrition caught up with Bonnie and asked her to share some helpful tips from her new book. In your book, you mention that a food label should be more like a table of contents than a billboard? What do you mean by this? A table of contents describes what is inside a book and labels should do the same by describing exactly what is inside a food product. It is important to look beyond the flashy, front of package advertising. Food companies use words to attract you to a product, but what’s inside is not always attractive. Food labels are jam packed with information. For busy, on-the-go parents who are trying to raise healthy families, what are the most important food label components to read? What quick guidelines would you suggest parents follow to help keep their families healthy? Labels speak to us all differently. For instance, if you’re concerned about your weight or your child’s weight, you might look toward total calories. But you also need to know what those calories are composed of because calories as a standalone can be misleading. A product that is low in calories is not necessarily healthy as it might also be low in vitamins and minerals, which is not part of a healthy diet. The ingredient label is also important to review. You want to choose products with short ingredient lists. If you’re buying almonds, and the only ingredient listed is almonds, then you know you’re getting a good product. There are two common myths that I also try to dispel. If you can’t pronounce it, don’t eat it. This is not always true because many difficult to pronounce words are often harmless, and sometimes helpful ingredients. For example, alpha-tocopherol is actually vitamin E and ascorbic acid, which sounds scary, is vitamin C. The other common myth is to shop the perimeter of the store. I discourage my patients from strictly shopping the perimeter because you can also make the most of the middle using advice from “Read It Before You Eat It”. Greener living has become a popular topic in our society with increased environmental awareness. Mainstream stores and popular brands now sell natural and organic products. These labels can be misleading. Can you explain the difference between products labeled natural and organic? Organic is a term that is specifically defined. Organic foods are produced without the use of synthetic pesticides, herbicides, fungicides, or synthetic fertilizers, and cannot be genetically modified or radiated. Organic poultry, dairy, meat and eggs are produced without the use of growth hormones or antibiotics, and are humanely raised and slaughtered. This definition, does not, however, reflect the nutritional value of a food. Many people think organic is synonymous with healthy, but organic candy is still candy. Natural, on the other hand, is the most popular term used on food labels, but it is not defined. If you buy a natural product, you’ll likely get a picture of a scenic farm or a grazing cow on a recycled box, but what’s inside the product may be questionable. Products use “health halos” like fresh, natural, and wholesome so we think the food product will be beneficial for our health. What three simple steps can you give to help people better navigate a grocery store for improved nutrition? Don’t go shopping on a hungry stomach. You will wind up spending more money, more time and more calories than you wanted. Make a shopping list before you go. 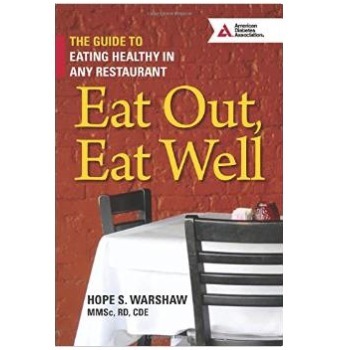 There is an entire section of “Read It Before You Eat” that is devoted to shopping lists. You don’t have to reinvent the wheel—utilize one of the shopping lists I provide to help you stay focused when you shop. Read it before you eat it. A food label will help you decide whether or not a product is a good choice as part of your healthy diet. As a busy career woman and mom, what is your family’s favorite go-to healthy meal that is quick and easy to prepare? Bolognese, which I actually just made this past weekend! I use ground turkey and a variety of vegetables. I will process carrots, celery, onions and garlic, sometimes broccoli for added flavor and nutrition. You can use just about any vegetable—that’s what so great about this dish. Sauté the ground meat and vegetables then add your own homemade tomato sauce and let it simmer while you make whole grain pasta and a side salad. 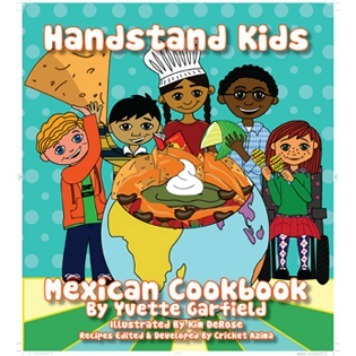 It’s full of flavor, kid friendly, easy to make, and best of all, healthy and delicious! Can you share three easy ways you stay fit and active with a busy schedule? Be active with your kids. Involve your kids with food. This is critically important to helping your kids develop good eating habits, the ability to make healthy food choices and an extensive palate. Ever since my kids could be propped up in a grocery cart, I’ve taken them shopping with me. Play games in the supermarket and have your kids spot the red or round foods. Have them help unpack the grocery and talk to them about food. And remember that they can help cook at any age—even tearing lettuce involves them in the process. Provide it and they will eat it. Kids come home hungry. Before they can go searching through the cabinets, have healthy food options available and ready to eat. Try chopped vegetables with a savory yogurt dip mixed with spices or fruits and vanilla yogurt. Bonnie Taub-Dix, MA, RD, CDN is Director and Owner of BTD Nutrition Consultants, LLC, with offices on Long Island and in New York City. 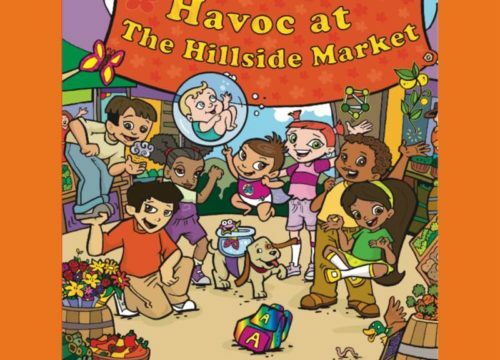 Visit her site and buy her book at https://www.bonnietaubdix.com/. In this role for the past thirty-three years, Bonnie counsels individuals, including many celebrities and dignitaries, as well as groups. She is an advisor to major corporations, law firms, food companies, and fitness clubs, setting up wellness programs, working on messaging, conducting seminars, and providing media interviews.